I love Arabic sweets and desserts...much more than I like cakes and cupcakes. I love the flavors of pistachio, orange blossom water, rose water and Qater (Simple Syrup). Arabic sweets are usually served in Ramadan to end the fast breaking meal (iftar). In my house, we prefer to keep Arabic sweets for special occasions such as having people over for Iftar or any other party. Osmaleeye (which means Ottoman in Arabic عثملية/عسملية) is often served in Lebanon with Ashta (clotted cream) but in Turkey it is served with cheese. Dont confuse turkish Kunefe with Lebanese Kunefe although both are served with cheese. 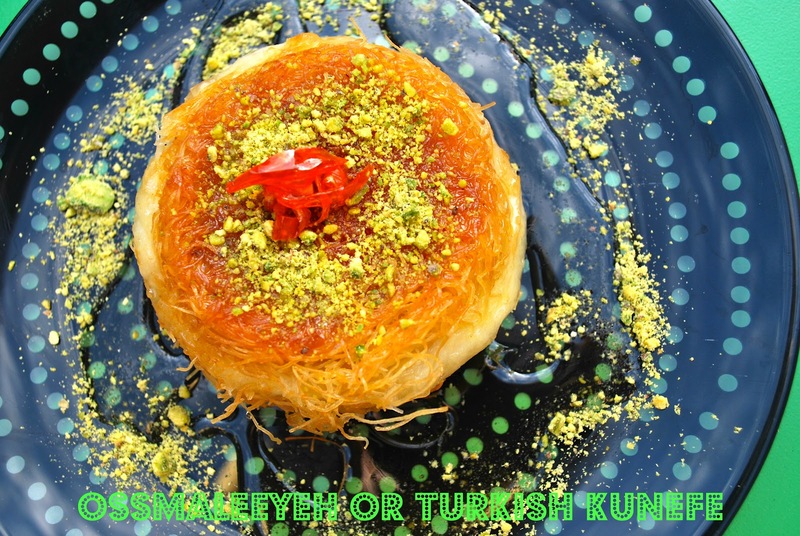 Turkish Kunefe or Osmaleeyeh crust is made with Kataifi or shredded phyllo dough that I buy from Middle Eastern markets. It is looks like strands of blond hair. I would say that this recipe is easy to make and I only make it on the spot because there is something about Osmaleeyeh that is fresh from the oven. I feel that the crispiness of the Kataifi will not be the same and will become soggy with time. If you are looking for an easy dessert recipe to impress, I think this is the one! My recipe is not the traditional Turkish recipe because Turks dont put as much Kataifi in their Kunefe and dont add pistachios and Orange Blossom. My recipe is more the Arabized version of a Turkish Kunefe which is to my preference. That is why I prefer to refer to it as Ossmaliyeh, the Arabic name instead of Turkish Kunefe. As for the filling, well you can use Akkawi cheese (جبن عكاوي) which is a Palestinian white brine cheese named after the city of Akka. Mozzarella can be equally used too. Just make sure to cut which ever cheese you use into 1 inch cubes and put it in water for 2 hours or more to remove all the salt from the cheese while changing the water every 30 minutes. Akkawi cheese may require longer because it is in brine. 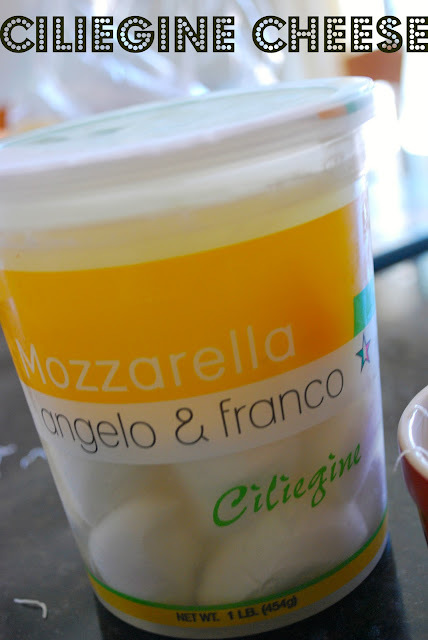 However, the other day I tried a special Angelo & Franco Ciliegine Mozzarella from Costco which is a cherry size fresh mozzarella that is made according to true italian traditions. It was pricy but worth every cent I paid. Ciliegine was perfectly delicious and sweet that you dont even need to put in water. The moment I tasted the cheese, I knew that I had to use it for Ossmaleeyeh. In a saucepan over medium heat, dissolve sugar in water. Bring to a boil. Reduce heat and simmer for 10 minutes, or until thickened. Add lemon juice to avoid crystallization of sugar and turn off the heat. Add orange blossom. It be stored at room temperature for same day use and kept in your fridge for future use. First start by grinding the unsalted pistachios. I use the magic bullet for small grinding jobs like this one, or you can use a food processor. I often grind some pistachios and leave them in the fridge in an air tight container. Melt the butter and make sure that you don't burn it. 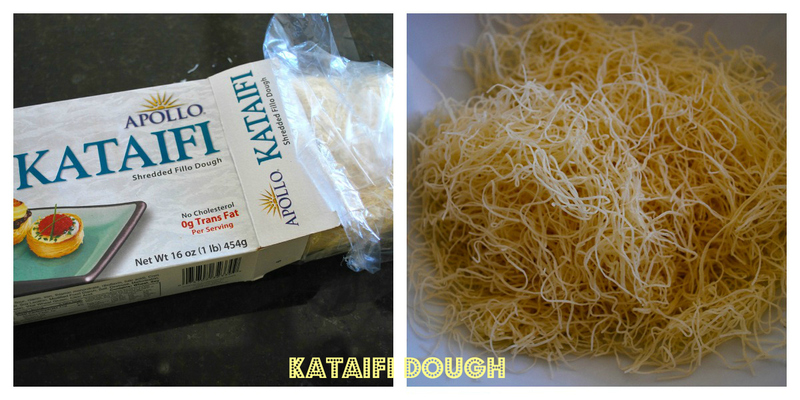 Place the Kataifi dough in a bowl and separate the strands. Mix the melted butter with the kataifi dough. If you feel that the kataifi mixture is too wet from the butter, add more kataifi dough. The mixture should not feel too wet. Divide the dough into 8 equal parts. Prepare the ramekins by brushing the ramekins with the melted butter, place one part of kataifi mixture in the bottom of the ramekin and tightly press it. 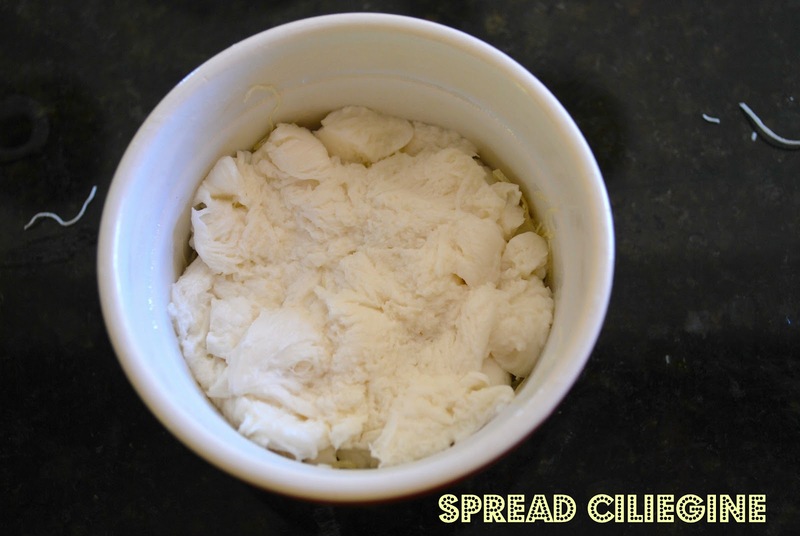 Spread 2 ciliegine pieces on the top of the pressed kataifi mixture while making sure to not spread them to the sides of the ramekins because when the cheese melts it would be too hard to remove the dessert from the ramekin. Just imagine that I did not spread it to the sides in the below pic...let us all imagine that. Layer another part of the Kataifi dough. Repeat the same steps for the remaining 3 ramekins. I like to place the ramekins on a baking sheet just because it makes my life easier when removing the ramekins from the oven. it is easier to remove a tray than four hot ramekins. Just remember to put on oven mittens! Keep them in the oven until golden brown, they might take 30 mins or 50 mins depending on your oven but the rule is until golden brown. As they become golden, set the oven on Broil, and broil for about 1 minutes, just to make the top crispy...now listen to me...keep your eyes on the ramekins, they can go from beautiful crispy golden to black charred in a blink of an eye, take it from me, it happened to me at a dinner party that I was hosting but luckily I manage to scrape the burned parts off. Now that they are crispy and golden, leave them in a safe place where they can cool down, and that is away from the hands of curious kids and husbands. With a sharp knife, loosen up the Ossmaleeyeh making sure that all the melted cheese is no longer clinging to the sides of the ramekins, it will make your life a whole lot easier. now place the serving dish that you wish to use on top of the ramekin and turn it upside down. The Ossmaleeyeh should be released, if not give it a while and make sure that nothing is still attached to the ramekin. Once released, put around 2 tablespoons of Qater (Syrup) on top of the Ossmaliyeh and around it, remember that there is no sugar in the recipe other than the sugar in the syrup and decorate with the finely ground pistachios on top and around the Ossmaleeyeh. Place 1/4 teaspoon of the Orange Blossom Preserve in the center, serve it while still warm and that is as soon as possible. Oh, you are wondering what is orange Blossom Preserve, well if you have not tried that, then you are in for a treat. It is basically a preserve that is made with orange blossom petals and it tastes and smells like orange blossom that is heavenly. I make my own and I will show you in a future post how to do it. If you dont have it then it is ok, but it does add something. Thanks Mark! Give it a try, it is really easy. All the ingredients can be found in a Middle Eastern market. Looks absolutely delicious! Will definitely try it. How large is the diameter of the ramekings or bowls?? Hi! The ramekin I used are 3 inches in diameter. You can use any ramekin size but adjust the cooking time accordingly.